There have been various claims made about the DC Design Rolls Royce Coupe, including that it's actually a Nissan or a Porsche. 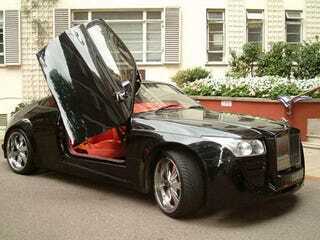 The reality seems to be that it actually started out as a Rolls Royce. We find this to be most hilarious since another car on this list is a cheap ride made to look like a Rolls and this is a Rolls Royce that looks like a Nissan. Given the apparent high quality of the build this was obviously created for a customer with more cents than sense as FatBraff discovered.